Learn what's on the horizon for Battlefield V, Battlefield 1, and Battlefield 4. The November 20 launch of Battlefield™ V is not far away. But to ease any burden of waiting a bit longer than originally intended, there is plenty on the road ahead for Battlefield – for all players. First off, there is a great opportunity to play Battlefield V just around the corner. The Battlefield V Open Beta* opens to the public on September 6 and runs until September 11. In the Open Beta, you'll be able to experience the multi-mode mayhem of Grand Operations along with classic Conquest on the Narvik map. Then tackle the urban Conquest fights of the Rotterdam map we revealed at Gamescom. We've gathered all you need to know about the Battlefield V Open Beta details in this article – have a look. 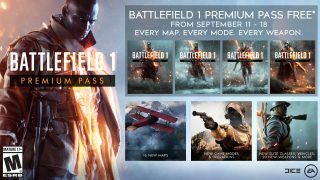 On the road ahead, you'll also find a rather grand giveaway of Battlefield 1 Premium Pass. You'll be granted access to all the maps, weapons, vehicles, and more from the four Battlefield 1 expansions — They Shall Not Pass, In the Name of the Tsar, Turning Tides, and Apocalypse. This means access to 16 multiplayer maps, new Operations and game modes, powerful Elite classes, and more. Battlefield 1 Premium Pass is a great way for Battlefield 1 base game owners to play all the great post-launch content and whet your appetite as we enter mankind's greatest conflict in Battlefield V, come November. Road to Battlefield V – our program of giveaways, missions, and map rotations – will continue. Claim rewards like weapon skins and special Dog Tags just for playing Battlefield 1 and Battlefield 4. Jump into the games or check in to the Calendar Page for details on what's coming.